Earlier this year, the ozone level in Wyoming’s once pristine Upper Green River Basin spiked beyond Los Angeles’ worst smog day. Thirteen high-ozone events this past winter from oil and gas activities in the region resulted in 10 state-issued warnings to remain indoors. Yet Wyoming’s governor and the oil and gas industry welcomed President Barack Obama’s decision last week to abandon the U.S. Environmental Protection Agency’s proposed 60-70 parts per billion ozone standard (compared to the current 75 ppb standard) to protect human health. And they say they can’t guarantee they will cut emissions in the Upper Green River Basin far enough to result in zero wintertime ozone spikes. “I don’t know that we can ever say, ‘no ozone spikes,’ because I don’t know that, based upon where we are, that everyone understands all that goes into an ozone spike,” Gov. Matt Mead said during a press conference in Casper on Thursday. The Upper Green River Basin may be particularly prone to ozone spikes when industrial emissions are introduced. But human health and environmental advocates say that’s no excuse to not do everything it takes to prevent dangerous ozone spikes. “NAAQS (National Ambient Air Quality Standards) are legally binding standards in all areas that are outdoors — ‘ambient’ air. That an area faces issues related to geography, weather patterns, etc., does not change the standard that is applicable and that must be achieved,” Wyoming Outdoor Council’s Bruce Pendery told WyoFile via email. 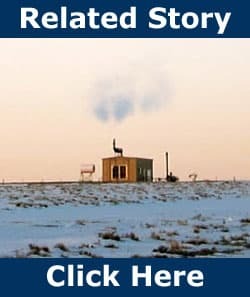 When there’s a wintertime temperature inversion, volatile organic compounds (VOCs) from natural gas facilities and nitrogen oxides (NOx) from tailpipe emissions are suspended low in the Upper Green River Basin valley — along with smoke from wood-burning stoves and other background pollution. When the valley is blanketed in snow, the VOCs and NOx are exposed to direct sunlight and light reflected from snow, causing a photochemical reaction that creates ground-level ozone — a serious human health threat. These wintertime ozone spikes began occurring in 2005, and continued in 2006 and 2008. The Wyoming Department of Environmental Quality began working closely with Jonah field operator EnCana Oil & Gas USA, and with Pinedale Anticline operators Shell, Ultra Petroleum and QEP Resources Co. Throughout Sublette County, VOC emissions were reduced 20 percent, and NOx decreased 25 percent, from 2008 levels. For two winters — 2009 and 2010 — the efforts seemed to work because there were no ozone spikes measured. But the emission reductions still were not enough to avoid 13 ozone spikes this past winter. Who’s To Blame? Industry Or Mother Nature? The question now is, how far will the state go to remedy the ozone problem? Even if EnCana, Shell, Ultra Petroleum and QEP Energy Co. reduce their emissions to maintain an average ozone concentration below 75 ppb, or even 60 ppb, many believe ozone could still spike into the L.A.-levels of over 100 ppb on occasion. “That could result in ozone spikes. Realistically, that’s true, based on the ozone standard,” Shell spokeswoman Darci Sinclair told WyoFile. To determine whether a region is in “attainment” of the ozone standard, the fourth-highest daily ozone level from each year is averaged over three years. Based on continuous air quality data collected in 2009, 2010 and the first two quarters of 2011, Sublette County’s official ozone level is 79 ppb, according to Wyoming DEQ. What concerns some residents and human health advocates is that Gov. Mead often suggests there are sources other than oil and gas activities that contribute significantly to the ozone problem. Others have suggested that smog and smog-causing pollution blows into the valley from Utah, Idaho and from Interstate 80 from the south. How much should the Upper Green River Basin’s topographic and atmospheric conditions factor in determining whether the industry is doing its fair share to prevent ozone spikes? So far, there’s no proof that transient pollution contributes to the ozone events measured in the Upper Green River Basin. Richard Garrett of the Wyoming Outdoor Council said DEQ’s analysis is based on many years of air quality monitoring and a tremendous volume of data, and it hasn’t been openly challenged by other scientists. “From our perspective, vague references to precursor occurrence from outside sources (like Salt Lake City) only serve to confuse the issue rather than solve it. People have legitimate concerns and those should not be minimized by widely held misperceptions,” Garrett told WyoFile via email. How Far Must Regulation Go? Just how far the state and federal government will go to resolve the region’s ozone pollution will play out in a new environmental impact statement (EIS) being prepared for EnCana’s proposed 3,500-well “Normally Pressured Lance” project, which will surround most of the Jonah field. Industry remains adamant that it can continue to reduce ozone-causing emissions in the region, but still insists that federal approval is only required to disclose potential environmental quality impacts — not to fully avoid impacts, including ozone spikes. “We are focused on reducing emissions. That is our goal, to reduce emissions. We’re pretty single-minded about that,” EnCana spokesman Randy Teeuwen told WyoFile earlier this week. Meanwhile, human health and environmental advocates say that this time around government officials don’t have to guess at what the environmental impacts of large-scale natural gas development might be in the region. They now have years of solid evidence and measurable impacts. The Wyoming Outdoor Council’s Bruce Pendery said the U.S. Bureau of Land Management and other federal agencies involved in crafting a National Environmental Policy Act document (an EIS, in this case), by federal law, may not approve of an action known to lead to a violation of federal environmental standards. “National Ambient Air Quality Standards are not set based on how hard or even impossible it might be to achieve them. They are set strictly based on what the science shows is necessary to protect public health,” said Pendery. In other words, even if an action — a proposed drilling expansion, for example — is likely to lead to a violation of the NAAQS, it won’t necessarily prevent the BLM from approving the action. But, Dietrich said, it does require a “mitigation” plan based on some very detailed modeling, and must attempt to avoid a violation of the NAAQS. So, whether or not Pinedale area residents can expect occasional ozone warnings for the next 15-20 years is a question still blowing in the wind. Pendery agreed there has to be some flexibility. “But the ‘target’ should be based on what the science shows is necessary for the protection of the public health,” he said. Ultra Petroleum spokeswoman Cally McKee told WyoFile that any federal environmental impact statement (EIS) and record of decision (ROD) that guide oil and gas activities are disclosure documents — not a contract stating there will be no negative environmental impacts. “You don’t develop a natural gas field without having some level of impact,” said McKee. Teeuwen said the industry has spent millions of dollars to lower emissions in the region, by consolidating facilities, using low-emission engines and other technologies. He said the success of the industry should be measured in those emission reductions. When he punted on the new ozone standard earlier this month, President Barack Obama (Democrat) said he did it for fear that meeting the lower threshold would further dampen the nation’s struggling economy. The estimated $90 billion cost to implement the recommended 60-70 ppb ozone standard could be a drag on the economy despite an estimated annual $37 billion in benefits from avoided health care costs in the short- and long-term, according to the president. Some Wyoming leaders have suggested the lower ozone standard would also be a “job killer” in Wyoming where the oil and gas industry isn’t even meeting the old standard in the Upper Green River Basin. But that’s not necessarily the case in Wyoming. Other Wyoming operators admit they’ve seen a financial advantage to cleaning up their emissions. Devon Energy, for example, hired Verdeo Group, Inc., of Casper to install low-bleed pneumatic valves on some of its Wyoming production facilities, keeping more gas in the pipeline for sale. Click here to read the Wyoming Department of Environmental Quality’s March 2009 report on ozone in the Upper Green River Basin. — Contact Dustin Bleizeffer at 307-577-6069 or dustin@wyofile.com.